How to use .htaccess file inside the folder. I'm using two .htaccess files in my hosting, one for labs.9lessons and another for touch.9lessons. Just take a look at this post how I had implemented. 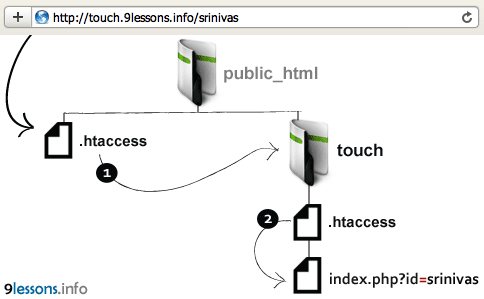 This code redirects sub domain http://touch.9lessons.info pointing to touch folder. This file inside the touch directory. Contains single parameter URL rewriting code. Firstable I want to thank you for this wonderful tutorials. I am trying to implement Htaccess example into my localhost, but some how I am not succeeding. Any kind of help will convenient. Thats simple method to do mod rewrite URL, cool!